Does Kanye West Have More The Life of Pablo Merch On The Way? Virgil Abloh is wearing a shirt with album’s artwork on the back. Earlier today, the DONDA Twitter account posted a picture of designer and DJ Virgil Abloh wearing a shirt with Peter De Potter's The Life of Pablo artwork on the back. The shirt was not for sale at Kanye West's The Life of Pablo pop-up in New York last month. 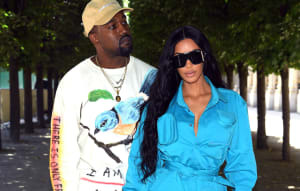 After previewing the "I Feel Like Kobe" shirt in public and then putting the shirt up for sale later the same week, Kanye West has recently set a precedent for himself with the surprise merchandise. Could this shirt be Kanye's next surprise drop?